The Great Industrial Building now in the course of erection, and which forms the subject of the present paper, was not the production of a momentary consideration of the subject. Its peculiar construction, in cast iron and glass, together with the manner of forming the vast roof, is the result of much experience in the erection of buildings of a similar kind, although on a smaller scale, which has gradually developed itself through a series of years. In giving, therefore, a description of the Building itself, it may not be uninteresting to give a brief account of the reasons which led me to investigate the subject of glass roofs and glass structures generally, and which have resulted in the Exhibition Building. In 1828, when I first turned my attention to the building and improvement of glass structures, the various forcing-houses at Chatsworth, as at other places, were formed of coarse thick glass and heavy woodwork, which rendered the roofs dark and gloomy, and, on this account, very ill suited for the purposes they were intended to answer. My first object was to remove this evil, and, in order to accomplish it, I lightened the rafters and sash-bars, by bevelling off their sides; and some houses which were afterwards built in this manner proved very satisfactory. I also at this time contrived a light sash-bar. having a groove for the reception of the glass; this groove completely obviated a disadvantage connected with the old mode of glazing, namely, the putty becoming continually displaced by sun, frost, and rain, after the sashes had been made for a short time, and the wet by this means finding its way betwixt the glass and the wood, and producing a continual drip in rainy weather. About this period the desire for metallic roofs began to extend in every direction; and as such structures had a light and graceful appearance, it became a question of importance as to the propriety of using metal sashes and rafters, instead of wooden ones, for horticultural purposes. After carefully observing the effects of those built by various persons, it became apparent to me that the expansion and contraction of metal would always militate against its general adoption, as at no season of the year could the sashes and rafters be made to fit. The extra expense, also, of erecting metallic-roofed houses was a consideration. In 1833 I contemplated building anew range of hot-houses, and being desirous of knowing how much they would cost if erected of metal, a plan of the range was prepared, and sent to Birmingham, and another to Sheffield, with a desire to be furnished with estimates for that purpose. The estimate from Birmingham was £1800; and the other, from Sheffield, was £1850. These appeared to me such enormous sums, that I at once set about calculating how much the range would cost, if built of wood under my own inspection; and the result was, that I was able to complete the whole range, including masonry (which was omitted in the metal estimates), for less than £500. Besides the extra cost of metallic roofs, we must add the extreme heat of such houses in hot weather, and their coldness in times of frost; the liability to breakage of glass from expansion and contraction of the metal; the very limited duration of the smaller portions, as sash-bars, from corrosion, by exposure to the alternations of heat, cold, and moisture, inseparable from gardening operations, and which could only be prevented by making use of the expensive material copper; and the difficulty, when compared with wood, of repairing any damages, as a wooden roof could at any time be set to rights by a common carpenter. These different items formed in my mind so many objections to its use, and the same disadvantages soon became generally apparent. It was now thought advisable by some parties, that, in order to obviate the many disadvantages in the use of metal, the rafters and frame-work of the sashes ought to be made of wood, and the sash-bars of metal This plan certainly presented more advantages than the other, yet it was quite obvious that materials so incongruous could never give satisfaction; and accordingly, in a few years, as I had anticipated, the rage for these structures gradually subsided, and the use of wood again became resorted to by most persons, as the best material for horticultural purposes. In the construction of glass houses requiring much light, there always appeared to me one important objection, which no person seemed to have taken up, or obviated; it was this. In plain lean-to, or shed roofs, the morning and evening sun, which is on many accounts of the greatest importance to forcing fruits, presented its direct rays at a low angle, and, consequently, very obliquely to the glass. At those periods most of the raws of light and heat were obstructed by the position of the glass and heavy rafters, so that a considerable portion of time was lost both morning and evening; it consequently became evident that a system by which the glass would be more at right angles to the morning and evening rays of the sun, wonld obviate the difficulty, and remove the obstruction to rays of light entering the house at an early and late hour of the day. 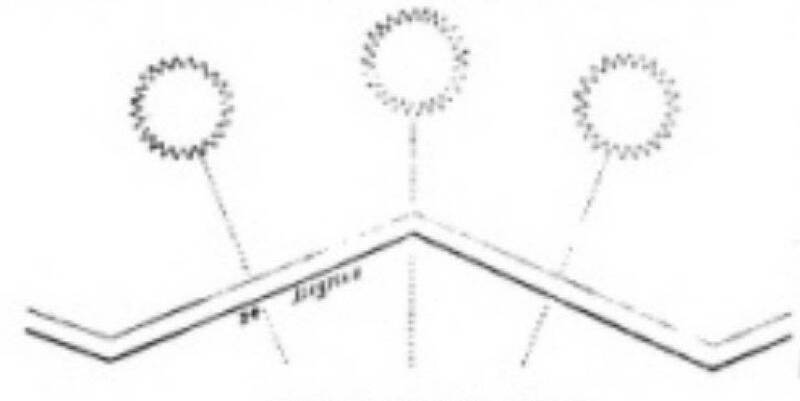 This led me to the adoption of the ridge and furrow principle for glass roofs, which places the glass in such a position that the rays of light in the mornings and evenings enter the house without obstruction, and present themselves more perpendicular to the glass at those times when they are the least powerful, whereas at mid-day, when they are most powerful, they present themselves more obliquely to the glass. I had this principle fixed in my mind, and being convinced of its importance, I constructed a pine-house in 1833 as an experiment, which still exists unimpaired, and has been fonud fully to answer the purpose. In 1834 I resolved to try a further experiment on a larger scale, on the ridge and furrow principle, in the construction of a green-house of considerable dimensions, which also remains, and answers admirably. For this building I made a still lighter sash-bar than any I had previously used; on which account the house, when completed (although possessing all the advantages of wood), was as light as if constructed of metal. The whole length of this structure is 97 feet, and its breadth 26 feet; the height at the back is 16 feet 9 inches, and in the front 12 feet 3 inches. A span so large as 26 feet could not be safely feet in length, I saw no reason £ they could not accomplish another foot; and, if this could not be done, I would decline giving the order, as, at that time, sheet glass was altogether an experiment for horticultural purposes. These gentlemen, however, shortly afterwards informed me that they had one person who could make it the desired length; and, if I would give the order, they would furnish me with all I required. It may just be remarked here, that the glass for the Exhibition Building is forty-nine inches long—a size which no country except England is able to furnish in any large quantity, even at the present day. In 1840 the Chatsworth Conservatory was completed and planted. The whole length of this building is 277 feet; its breadth, 123 feet over the walls; and the height, from the floor to the highest part, 67 feet. Notwithstanding the success which attended the erection of these buildings, it covered with a roof constructed in the ordinary way, unless the sash-bars were stronger, and the assistance of heavy rafters and numerous supports was afforded. The house presents a neat and light appearance, and consists of 15 bays, and pediments in front, supported by sixteen slender reeded cast-iron columns, Whilst it makes an admirable green-house, it is also an economical building; for, at the period of its construction, notwithstanding the heavy tax on glass (since removed), it only cost at the rate of 2d. and a fraction per cubic foot. At the present time, considering the change in the price of material, and the removal of the glass tax, it could be constructed at a considerably smaller amount. Sash-Bar Machine. Click on image to enlarge it. In 1837 the foundations of the Great Conservatory were commenced, and in constructing so great a building, it was found desirable to contrive some means for abridging the great amount of manual labour that would be required in making the immense number of sash-bars requisite for the purpose. Accordingly, I visited all the great workshops in London, Manchester, and Birmingham, to see if anything had been invented that would afford the facilities I required. The only apparatus met with was a grooving machine, which I had at once connected with a steam-engine at Chatsworth, and which was subsequently so improved as to make the sash-bar complete. For this apparatus the Society of Arts, in April, 1841, awarded me a medal; and this machine is the type from which all the sash-bar machines, found in use throughout the country at the present time, are taken. As the Conservatory was erected under my own immediate superintendence, I am able to speak accurately as to the advantages of the machine: it has, in regard to that building alone, saved in expenses £1400. The length of each of the bars of the Conservatory is 48 inches; only one inch shorter than those of the Exhibition Building. The machine was first used in its present form in Aug., 1838; and its original cost, including table, wheels, and everything complete, was £20. The motive power is from a steamengine employed on the premises for other purposes: and any well-seasoned timber may be used. The attendants required are only a man and a boy, and the expense of the power required for it when in use is comparatively trifling. The sash-bars may be made of any form, by changing the character of the saws. There is one particular feature in working the machine, namely, the bar is presented to the saws below the centre of motion, instead of above it (as is usual), and to the sides of the saw which are ascending from the table, instead of those which are descending. 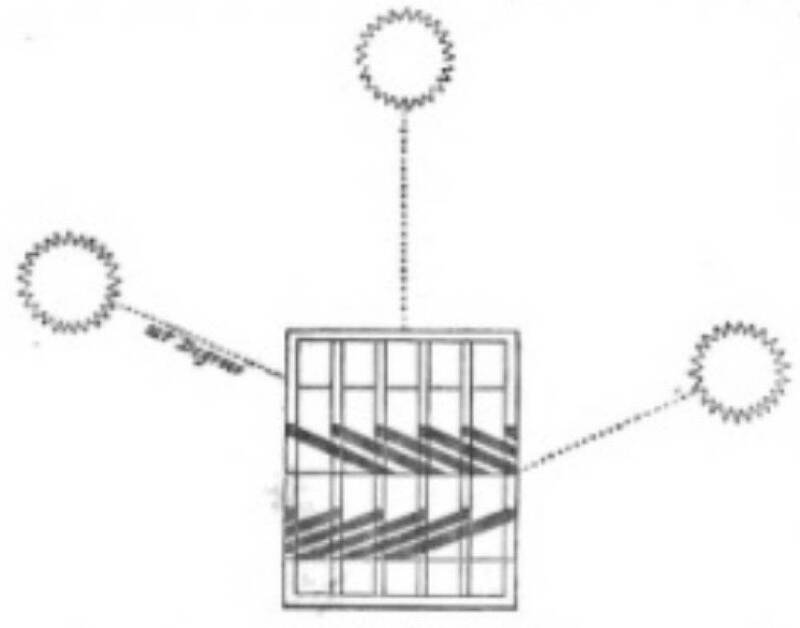 These arrangements were necessary to suit the direction of the teeth, to the grain of the wood; for when the bars were presented to the saws in the usual way, the wood was crushed instead of being cut and cleaned. It is essential that the machine should revolve 1200 times in a minute, to finish the work in a proper manner. The glass and glazing of the Chatsworth Conservatory caused me considerable thought and anxiety, as I was very desirous to do away altogether with the numerous overlaps connected with the old system of glazing with short lengths. This old method: even under the best of management, is certain, in the course of a few years, to render unsightly any structure, however well built. In the course of my enquiries, I heard that Messrs. Chance and Co., of Birmingham, had just introduced from the Continent the manufacture of sheet glass. Accordingly, I went to see them make this new article, and found they were able to manufacture it three feet in length. I was advised to use this glass in two lengths, with one overlap, but to this I could not assent; as I observed, that since they had so far advanced as to be able to produce sheets three became to me a question of importance how far an extensive structure might be covered in with flat ridge and furrow roofs, that is, the ridge and valley rafters placed on a level, instead of at an inclination, as in the greenhouse or curvilinear, as in the Great Conservatory. I therefore prepared some plans for an erection of the kind for the Earl of Burlington, somewhere about ten years ago; but, on account of the lamented death of the Countess, the design of erection was abandoned. However, from that time, I felt assured, not only that it could be done satisfactorily, but that the most appropriate manner to form and support level glass roofs, to a great extent, was that adopted this year for the New Victoria House at Chatsworth, which may be considered a miniature type of the Great Industrial Building. Before describing this house, however, it may be well to notice two instances, in which the flat roofs had been previously tried, and in both cases with the most perfect success. DARLEY DALE, Near Matlock, 18th July, 1850. MY DEAR MR. Paxton, — I have much pleasure in complying with your request, to state how the flat-roofed, boarded conservatory attached to your house here answers, and for what purposes I am able to use it. As a conservatory, it seems fully to answer its purpose. But the use we chiefly make of it is as a sitting-room; we find it so dry, light, and airy, while preparing the house for our residence, during the last winter and spring, it was filled with an sorts of furniture and books, pictures, &c., and a piano: nothing received any injury; indeed, we selected it for being, what it has proved, the most dry and airy part of the house. I cannot conceive its construction could be improved so as to better answer the purposes for which you designed it. The second instance is this:— In the spring of 1848, plans were prepared for the erection of an ornamental glass structure, to cover the conservative wall at Chatsworth. This wall was previously a plain fued structure, devoted to the growth of rare and choice plants. The new erection is 331 feet in length, and seven feet in width. It is divided into 10 bays, with an ornamental centre projecting beyond the general line of the building. Each bay is subdivided by smaller bays, which are separated by glass pilasters, the glass sashes are so arranged that they can be removed in summer and the whole thrown open to the gardens, whilst in winter the building affords an extensive promenade under cover. The ground on which this structure is built has a fall of 25 feet 6 inches in its whole length ; censequently there is a proportionate fall at each bay, which gives great variety: and obviates the monotony that would be exhibited in a building of such length and dimensions placed on a uniform level. the lower side of each bay is finished by a glass pilaster, three feet in width, and surmounted by a vase on the wall behind, The roof is on the ridge and furrow principle, with the rafters on a very slight inclination; and the ventilation is effected in a similar but more perfect manner than that already described as in use at the conservatory at Darley Dale. The new Victoria Regia House, which presents a light and novel appearance, is 60 feet 6inches in length, and 46 feet 9 inches in breadth Although, when compared with the Great Industrial Building, the victoria House is a very diminutive structure, yet the principles on which it is constructed are the same, and may be carried out to an almost unlimited extent. the form of the roof, the general elevation, the supports, and the mode of construction are all quite simple, and yet fully answer the purposes for which they were intended. The Victoria House, however, was so built as to retain as much moisture and heat as possible, and yet to afford a strong and bright light at all seasons; whilst, on the contrary, the Industrial Building, being intended to accommodate a daily assemblage of many thousands of individuals, and a vast number of natural and mechanical productions, many of which would be destroyed by moisture and heat, is constructed so as to fully answer that end. My reasons for offering a design for this building were these:-When plans for the structure were sent in by various parties who answered the invitation of the Royal Commissioners, many forcible and cogent reasons were urged and published in the daily papers against the propriety of erecting a large building of bricks and mortar in Hyde-Park. It was not until this period that I turned my attention to the matter, when I was at once convinced that the least objectionable structure to occupy a public park would be an erection of cast iron and glass; whilst at the same time a building of this description would be in every point of view the best adapted for the purposes of the Exhibition. The time for receiving the designs had expired; but from having the whole matter already digested, and the system of ridge and furrow flat roofs so fully impressed on my mind, it only required the adaptation of the principle on a large scale to suit the vast building for the Exhibition: My plans were got up in about ten days, when I had the satisfaction of their being ultimately approved of by the Commissioners. The design for the building involved various considerations, and therefore it was planned, first with particular consideration as to its fitness for the object in view, namely, the Exhibition of 1851; and, secondly, its suitableness for the site proposed to be occupied by the structure; and, lastly, with a view to its permanence as a winter garden, or vast horticultural structure, or a building which might, if required, be again used at any future period for a similar Ex- The whole intermediate spaces between the walks and drives would be planted Exhibition to that of 1851. One great feature in the present building is, that not a vestige of either stone, brick, or mortar is necessary to be used; but the whole is composed of dry material, ready at once for the introduction of articles for the Exhibition. 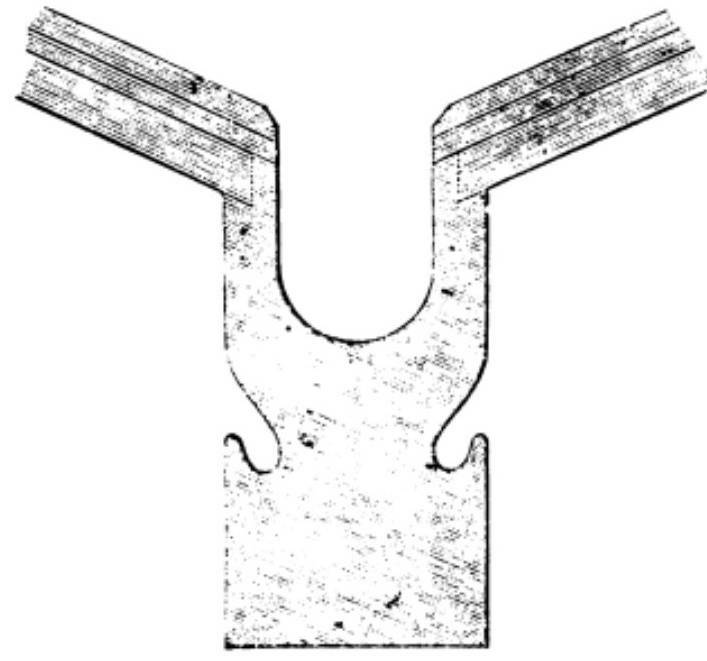 By no other combination of materials but iron, and wood, and glass, could this important point be effected; and when we consider the limited period allowed for the erection of so stupendous a sructure, the attainment of this object has secured what may almost be deemed the most important consideration. The absence of mortar, plaster, or any moist material in the construction, together with the provision made for the vapours which will necessarily arise, and are condensed against the glass, enables the exhibitor at once to place his nanufactures in their respective situations, without the probability of articles even of polished ware being tarnished by their exposure. As to the appropriateness of this style or class of building, it has already been remarked that a glass structure is the least objectionable of any description of building that could be erected in a public park, where the mass of the community look with a jealous eye on any matter which they may fancy is an encroachment on their rights. And, on the supposition that the bnilding will remain as a permanent structure, the lights might be removed in summer and the whole thrown open, when the space occupied would still form a part of the park, with the simple obstruction of the cast-iron supports. The dimensions of the building are 185i feet in length, and 456 feet in breadth in the widest part. It covers altogether more than 18 acres; and the whole is supported on cast-iron pillars, united by bolts and nuts, fixed to flanges turned perfectly true, and resting on concrete foundations. The total cubic contents of the building are 33,000,000 feet. The six longitudinal galleries, 24 feet in width, running the whole length of the building, and the four transverse ones of the same dimensions, afford 25 per cent additional exhibiting surface to that provided on the ground-floor, This extra space is suited for the display of light manufactured goods, and will also give a complete view of the whole of the articles exhibited, together with an extensive view of the interior of the building. In order to give the roof a light and graceful appearance, it is built on the ridge and furrow principle, and glazed with British sheet glass, as previously described. The rafters are continued in uninterrupted lines the whole length of the building. The transept portion, although covered by a semicircular roof, is also on the angular principle. All the roof and upright sashes being made by machinery, are put together and glazed with great rapidity; for, being fitted and finished before they are brought to the place, little more is required on the spot than to place the finished materials in the position intended for them. The length of sash-bar requisite is 205 miles. The quantity of glass required is about 900,000 feet, weighing upwards of 400 tons. All round the lower tier of the building, however, will be boarded with fillets, planted on in a perpendicular line with the sash-bars above. I have tried many experiments in order to find out the most suitable floors for the pathways of horticultural structures. Stone was objectionable on many accounts, but chiefly on account of the moisture and damp which it retained; and was therefore uncomfortable, especially to those wearing thin shoes. The difficulty of getting rid of the waste from the watering of plants, was also an objection; but perhaps the greatest is the amount of dust from sweeping, which always proves detrimental to plants. I likewise found that close boarding for pathways was open to many of the same objections as stone; for although damp and moisture was in part got rid of, yet still there were no means of immediately getting rid of dust. These various objections led me to the adoption of trellised wooden pathways, with spaces between each board, through which, on sweeping, the dust at once disappears, and falls into the vacuity below. Whilst the accomplishment of this point was most important in plant-houses, I consider it doubly so with respect to the Industrial Building, where there will be such an accumulation of various articles of delicate texture and workmanship. Before sweeping the floors of the Great Building, the whole will be sprinkled with water from a moveable hand-engine, which will be immediately followed by a sweeping-machine, consisting of many brooms fixed to an apparatus on light wheels, and drawn by a shaft. By this means, a large portion of ground will be passed over in a very short space of time. The boards for the floor will be 9 inches broad, and 13 inch thick, laid half an inch apart, on sleeper joists 9 inches deep and 3 inches thick, placed 4 feet apart. This method of flooring, then, possesses the following advantages:–It is very economical; dry, clean, pleasant to walk upon; admits of the dust falling through the spaces; and even when it requires to be thoroughly washed, the water at once disappears betwixt the openings, and the boards become almost immediately fit for visitors. The galleries will be laid with close boarding. This point has been most carefully considered. A building where so many individuals will congregate must require a constant admission of pure air, and a most copious supply is provided. Four feet round the whole of the basement part of the building is made of louvre-boarding; and at the top of each tier a similar provision of 3 feet is made, with power to add an additional quantity if required. In the centre aisle, also, the air will be plentifully admitted. By simple machinery the whole of this ventilation can be regulated with the greatest ease. The advantages of this kind of ventilation are several. Louvre boards are very simple in construction. They can be opened and closed instantaneously, with the greatest readiness. They nicely distribute the air, and yet admit a large volume of it; and, from the manner in which they are placed over each other, they effectually prevent the entrance of wet in rainy weather. In order to subdue the intense light in so large a building covered with glass, all the south side of the upright parts, and the whole of the angled roof, will be covered outside with canvas or calico, so fixed as to allow a current of air to pass between the canvas and the roof; in very hot weather water may be poured on, which will very much assist in cooling the temperature within. Provision will be made to use the Indian plan of ventilation, if the heat is so intense as to render it desirable to have the temperature cooler than out of doors. A house was fitted up last summer, at Chatsworth, as an experimental place to try this mode of ventilating, when it was found to answer the purpose admirably. The temperature was reduced in an hour from 85 to 78 degrees, without any other means being used to increase the draught through the building. This sort of covering offers the following advantages: the brightness of the light will be tempered and subdued, the glass will be protected from the possibility of injury by hail; the screen being placed on the outside will render the building much cooler than if it were placed inside; and, through this provision, the ventilation can be regulated at pleasure. From the side galleries, running the whole length of the building, there will be grand views of the goods and visitors below, whilst the transverse galleries in the middle and at the ends will afford ample means for general supervision, and will serve to communicate between the side galleries. Magnifying-glasses, working on swivels, placed at short distances, will give additional facility for commanding a more perfect general view of the Exhibition. After the Exhibition is over, I would convert the building into a permanent winter garden, and would then make carriage drives and equestrian promenades through it. Pedestrians would have about two miles of galleries, and two miles of walks upon the ground floor, and sufficient room would then be left for plants. The whole intermediate spaces between the walks and drives would be planted with shrubs and climbers from temperate climates. . In summer, the upright glass might be removed, so as to give the appearance of continuous park and garden. A structure where the industry of all nations is intended to be exhibited, should, it is presumed, present to parties from all nations a building for the exhibition of their arts and manufactures, that, while it affords ample accommodation and convenience for the purposes intended, would of itself be the most singular and peculiar feature of the Exhibition. How far this has been accomplished, I must leave to the community to decide. 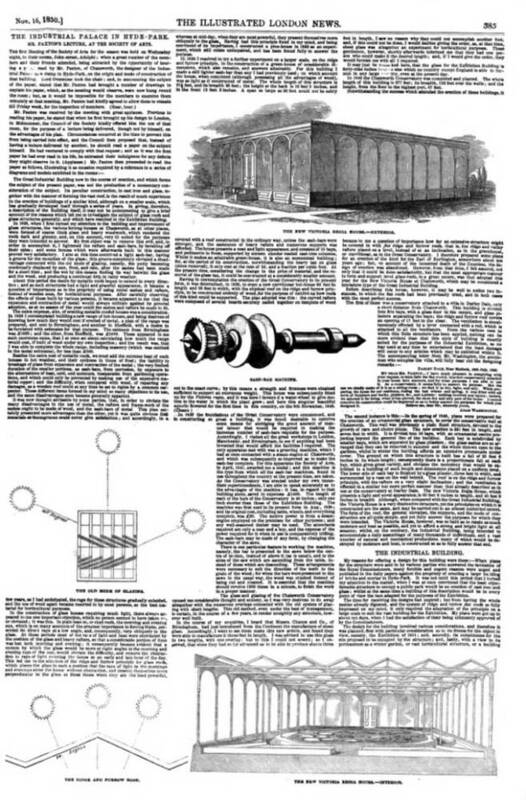 Layout of first page of the article. I have now endeavoured to give a brief outline of the Exhibition Building of 1851. It will be seen, from the simplicity of all its parts, together with the simplicity of the detail, that the construction does not offer a subject that requires me to dwell longer upon. The section of one part shows the whole; for it is only by the multiplication of these parts that the stupendous structure now in progress is extended. When I consider the cheapness of glass and cast iron, and the great facility with which it can be used, I have no doubt but many structures similar to that at Darley will be attached to dwelling-houses, where they may serve as sitting-rooms, conservatories, waiting-rooms, or omnibus-rooms, if I may be allowed the expression. I am now, in fact, engaged in making the design for a gentleman's house, to be covered wholly with glass; and, when we consider that, wherever lead is now used, glass may, with equal propriety, be substituted, I have every hope that it will be used for buildings of various conditions and character. Structures of this kind are also susceptible of the highest kind of ornamentation in stained glass and general painting. I am not without hope, however, that it will become almost universal in its use, and that the system will be extended for manufacturing purposes, as well as general cemeteries, and also for horticultural buildings, so that even market gardeners will advantageously apply it in the growing of foreign fruits for the London markets. I even go so far as to indulge in the sanguine hope that agriculture will be ultimately benefited by the application of cast iron and glass. In short, there is no limit to the uses to which it may be applied — no foresight can define the limits where it will end; and we may congratulate ourselves that in the nineteenth century the progress of science and the spirit of manufacturers have placed at our disposal the application of materials which were unknown to the ancients, and thereby enabled us to erect such structures as would have been deemed impossible even in the early part of the present century. At the conclusion of the lecture, a short conversation on some of the details of the structure took place; after which a vote of thanks was proposed, and passed by acclamation, to Mr. Paxton, for the paper he had read. “The Industrial Palace in Hyde-Park. Mr. Paxton’s Lecture, at the Society of Arts.” Illustrated London News. (16 November 1850): 385-96. Internet Archive version of a copy in the University of Michigan Library. Web. 23 August 2017.